SIL Solver® Version 7.1, our desktop version, has entered its sunset phase and is no longer for sale. We maintain this page for our current V7.1 users. We are continuing to provide technical support for V7.1, but will not be releasing any database updates or adding any new features. New inquiries should refer to the SIL Solver Enterprise link for information about SIL Solver’s new interface, enhanced features and expanded capabilities. 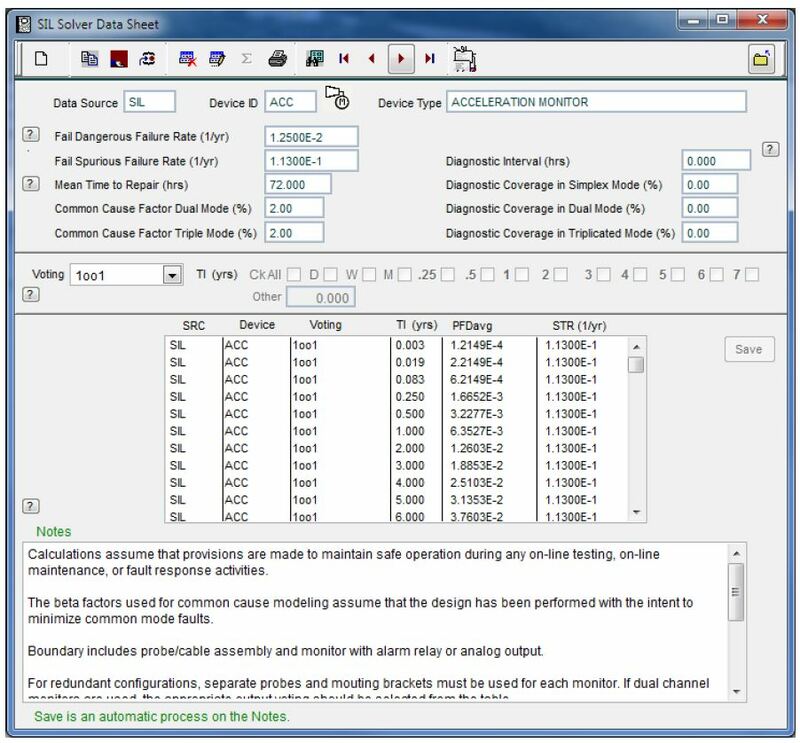 SIL Solver® V7.1 integrates an extensive device database with simplified fault tree analysis equations to provide you with an SIL Verification tool that delivers significant cost and time savings. The software runs on a Microsoft Windows platform and utilizes standard user interface components. When you use the software for the first time, you will be surprised by how simple it is to enter and review data and how quickly you can model a safety function. 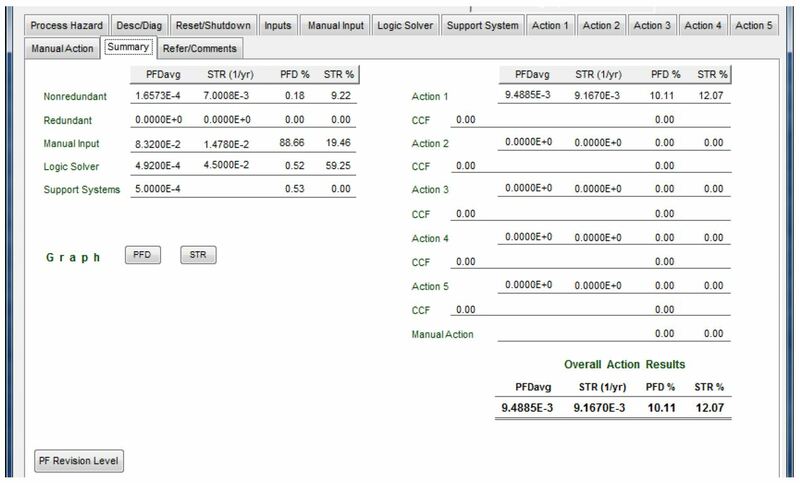 In addition to calculating the probability to fail on demand average (PFDavg), the mean time to failure spurious (MTTFs) is also calculated, ensuring that you are designing a system that not only meets your target SIL, but also your reliability goals. This software product has been rigorously tested both by the developers and users in the field. The product uses an internationally recognized method for calculating the PFDavg and MTTFs, enabling you to focus on modeling your safety function rather than the equations or calculations. The percent contribution of each device or subsystem to the overall calculated values is provided, so that design weaknesses can be easily identified and corrected. This makes you more productive by allowing you to fully concentrate on the system being analyzed, reducing mistakes. The SIL Solver® database includes the most commonly utilized components for safety function design. Whenever possible, real data representing the device in the user application environment installed-state is utilized, instead of the manufacturer’s shelf-state data. The password-protected database includes safe and dangerous failure rates, common cause factors, diagnostic intervals, and diagnostic coverage for a wide range of devices, including switches, transmitters, relays, PLCs, solenoids, valves, motor contactors, and more. Each datasheet lists the assumptions made relative to the device boundary, diagnostics, common cause factor, and data source. If you want to add your own data, dropdowns and check boxes make it easy to create datasheets within the standard default database or in a project-level database. All SIL Solver® users become members of the database users group, establishing acceptable values for various devices on a confidential basis. As our understanding of the data evolves, you will be kept abreast of these changes. This provides a high level of assurance that the data used in any analysis meets the latest good engineering practice. The hardest part of SIL Verification is determining what is required to achieve safe operation. For this reason, SIL Solver® includes the ability to document the process hazard, defining what must be mitigated, and the safety function description, detailing how this hazard is mitigated from input measurement to output action. The description may also include other actions taken as part of the overall interlock strategy. 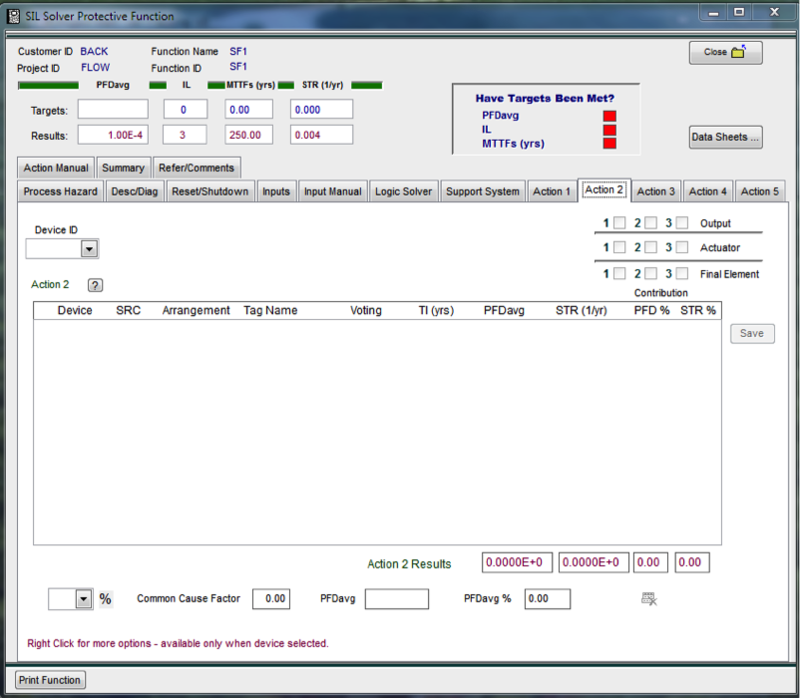 Documentation sources are important, so SIL Solver® provides space for listing reference documents. Safety function targets can be entered into SIL Solver®, allowing it to immediately indicate when the target values have been met. Tabs are provided for ease of navigation between the input, logic solver, support system, and action screens. Using SIL Solver® is as easy as defining 1) what you are measuring, 2) what is the decision you are making, and 3) what actions you are taking to complete the model of your SIS design. Safety functions can consist of multiple components or multiple subsystems. Each device datasheet is accessed using drop downs, which allow you to view the PFDavg and MTTFs data for various architectures and testing frequencies. This enables you to select a combination that works the first time rather than having to perform numerous calculations to find the optimum solution. If questions arise concerning data assumptions, the datasheets are easily accessible from the safety function screen. You see the overall result, but do not understand how you got there? Well, simply click on the summary tab to look at the overall safety function results. Once you have completed your model, you can use this screen to get a snapshot of how each subsystem is affecting the overall results. This enables you to rapidly zero in on where your best opportunities are for improvement of the safety function design. Consequently, SIL Solver® allows you to optimize the design and testing interval in order to reduce lifecycle costs, while meeting operational and safety performance targets. For more information or technical support contact Angela Summers at 713-909-2114 or asummers@sis-tech.com.